Due to a recent question here about the German surrender ending World War II in the European theater, I started also investigating the end of the war in the Pacific theater. I was curious about the number of pens used to sign the Japanese instrument of surrender and where they are located today. General Kenney Reports: A Personal History of the Pacific War which reports the disposition of the pens as follows: (1) Wainwright, (2) Percival, (3) Military Academy at West Point, (4) Naval Academy at Annapolis, (5) MacArthur's own souvenir, (6) his wife. The Art of Surrender: Decomposing Sovereignty at Conflict's End by Robin Wagner-Pacifici, University of Chicago Press, 2005 (this includes an account from General Wainwright): (1) Wainwright, (2) Percival, (3, 4 & 5) various [unspecified] organizations, (6) wife Jean. A Pen Runs Through It, by Stephen Kavalin on EMS World, with assistance from Charlie Knight Curator, and James W. Zobel Archivist/Historian, MacArthur Memorial MacArthur Square, Norfolk, Virginia 23510: (1) Wainwright, (2) Percival, (3 & 4) "Two of the remaining pens are part of the collection at the MacArthur Memorial in Norfolk, VA", (5) wife, "Jean's original Parker Duofold was lost (stolen) in the years following the ceremony." (6) MacArthur's wife, Jean (reported lost or stolen a few years after the war - any news of it since then?). The Pen Market: Pens used to end World War II (European and Pacific Theaters). It appears that the answer to the first part of your question is contained in the Memoirs of Col. Hervey Bennett Whipple, who was MacArthur’s chief logistics officer, and who oversaw the arrangements for the signing ceremony. He used six pens on 2 September 1945. MacArthur intended to give pens to Lieutenant General Jonathan Wainwright; Lieutenant General Arthur Percival; the National Archives; West Point; General Courtney Whitney, a staff officer; and Jean MacArthur, his wife. Four of the pens were desk pens from a now-unknown source, one was borrowed from Whitney, and the last was Jean MacArthur’s. MacArthur returned his wife’s small red Parker Duofold Jr., the final pen he used, to his pocket as soon as he used it. He gave Wainwright and Percival their pens on the spot. He returned Whitney’s Sheaffer fountain pen that evening. Two other pens he left on the table. When British Admiral of the Fleet Bernard Fraser sat down at the table, he used both pens and presented them to two of his aides. Major General Charles Willoughby, MacArthur’s wartime director of intelligence, retrieved the pens, and they went to the National archives and West Point. Whipple had found his metier in logistics. He was obsessed with the nuts and bolts of whence things came and where they went. He spills much ink over the matter of the pens. 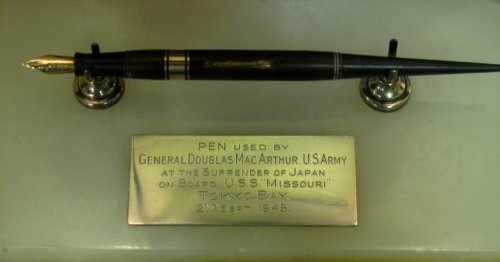 MacArthur intended to give pens to Wainwright, Percival, the National Archives, West Point, Mrs. MacArthur and Gen. Courtney Whitney, a staff officer. MacArthur returned his wife’s small red fountain pen to his pocket as soon as he used it. He gave Wainwright and Percival their pens on the spot. He returned Whitney his Shaeffer fountain pen that evening. Two other pens he left on the table. 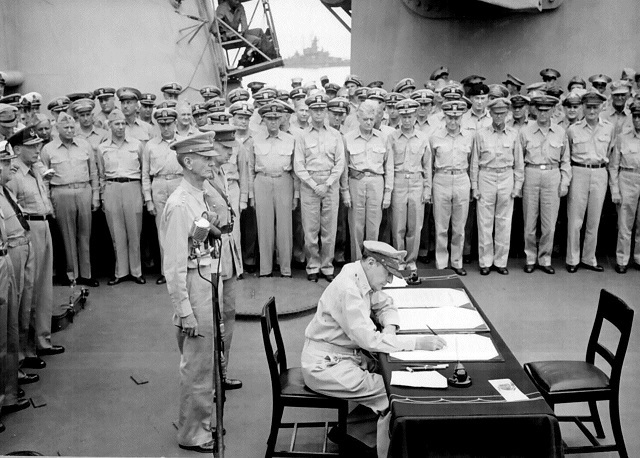 When Adm. Fraser, “resplendent in tropical white uniform,” sat down at the table, he used both pens and presented them to two of his aides. Whipple overheard an American general, perhaps James Doolittle, whisper, “I see the British are still lend-leasing our equipment.” Maj. Gen. Willoughby got the pens back. Whipple breathed easier after MacArthur opened the ceremony. 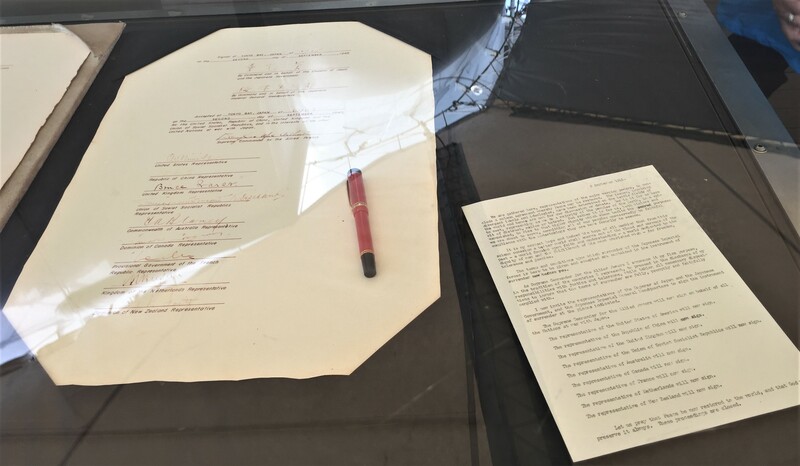 The MacArthur Memorial in Norfolk, Virginia, has produced this video about the pens used to sign the Instrument of Surrender as part of their artiFACTS series. As the curator, Jim Zobel, explains, the locations of the four Waterman fountain pens is known, as is that of General Whitney’s Sheaffer fountain pen (believed to still be held by the family). General Whitney’s Sheaffer fountain pen is believed to still be held by the Whitney family. The sixth pen, a small red Parker Duofold Jr belonging to MacArthur's wife, Jean, was stolen from her apartment in the Waldorf Astoria. A replica of this pen can be seen at the USS Missouri Museum. It appears that Colonel Hervey Bennett Whipple's memoirs weren't widely published (I haven't been able to find a copy in a library or archive in the UK). A copy is lodged with the Library of Congress, but there doesn’t appear to be a copy online. If you are after more detail, you may need to consult the original papers at the MacArthur Memorial in Norfolk, Virginia, or at the Library of Congress. Not the answer you're looking for? Browse other questions tagged united-states world-war-two 20th-century japan ww2-pacific-theater or ask your own question. Did MacArthur ever consider ordering Wainwright's troops to fight an insurgency war, rather than surrendering? Proportionally speaking, how many European refugees were accepted by Middle Eastern and African countries during World War 2?